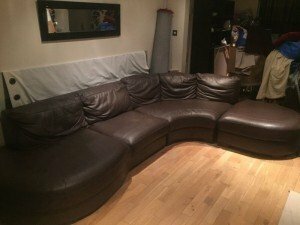 A large five seater low back sectional corner sofa on solid wood feet, upholstered in chocolate brown leather. 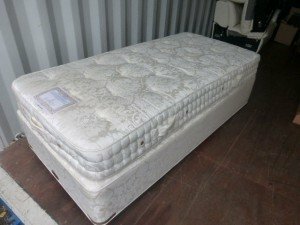 A Vi-spring single divan bed on castors with matching single mattress, upholstered in damask patterned fabric. 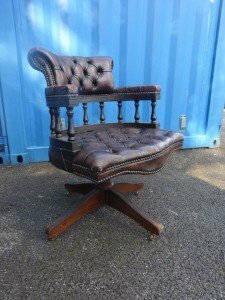 A vintage Chesterfield swivel chair on wooden legs and brass castors, upholstered in brown leather. 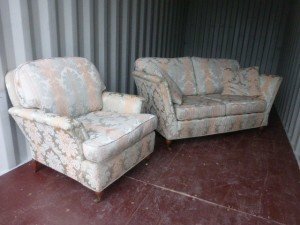 A vintage high back two seater sofa and matching armchair on wood legs and brass castors, upholstered in damask patterned satin. 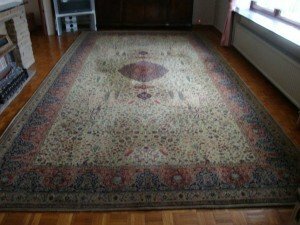 A large vintage area rug in the oriental style, decorated with colourful blue and red patterns against a camel ground. 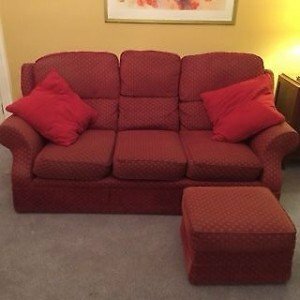 A three seater high back sofa and matching square storage footstool, upholstered in patterned red fabric. 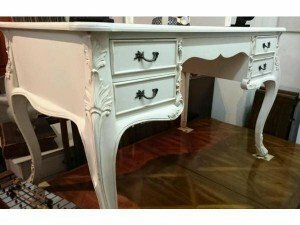 A solid wood hand painted white vanity dresser in the French style, having four drawers. 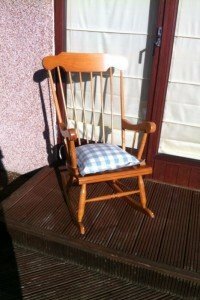 A vintage solid wood high back rocking chair, together with a small blue and white gingham cushion. 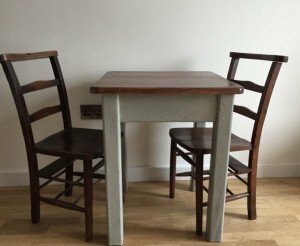 A small solid wood hand painted grey breakfast table, together with two matching high back dining chairs. 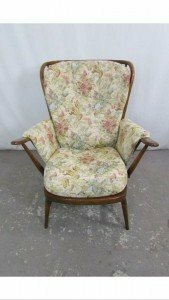 A vintage Ecrol high back gentleman’s armchair, upholstered in colourful floral patterned fabric. 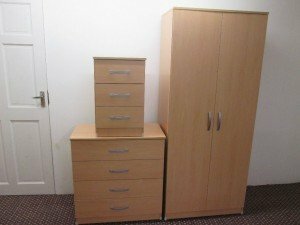 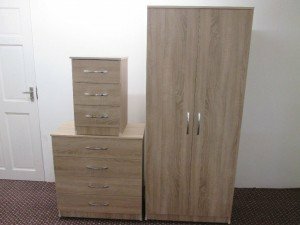 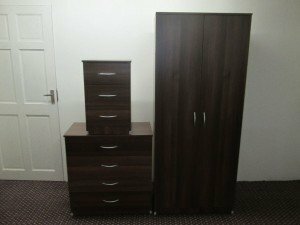 A three piece wood bedroom furniture suite, includes a double wardrobe, a bedside chest of three drawers, and a chest of four drawers. 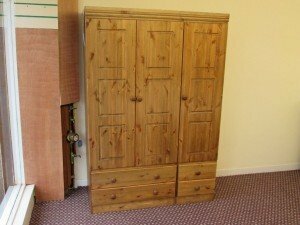 A tall standing solid wood triple wardrobe, having three doors above two large and two small drawers. 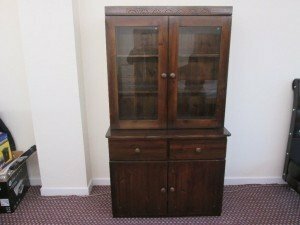 A vintage solid wood Welsh dresser, having two glass inlaid doors opening to reveal two shelves, two drawers above a double cupboard. 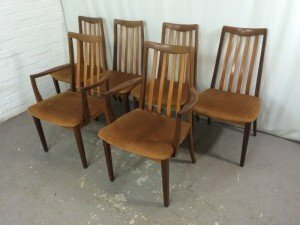 A set of six vintage G plan Fresco teak dining chairs, upholstered in light brown velour. 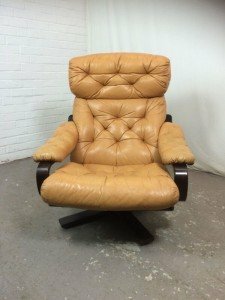 A 1970’s Danish mahogany swivel desk chair on castors, upholstered in tan leather. 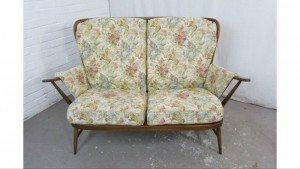 A vintage enrol two seater high back sofa, upholstered in colourful floral patterned fabric. 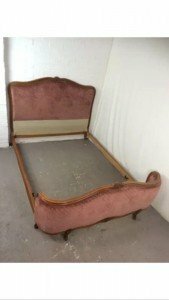 A vintage French mahogany double bed frame on paw feet, upholstered to the headboard and footboard in pink velour. 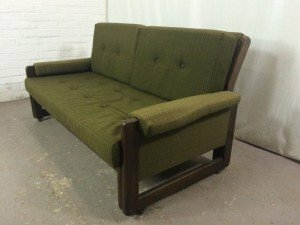 A vintage Danish mahogany two seater high back sofa, upholstered in army green cotton.